There’s no doubt that Serum’s ability to create unique wavetables sets itself apart from other synths. Did you know that you can take those completely unique wavetables and use them as modulation sources in FM synthesis? This is where we think Serum’s true potential is really unlocked. World class producers have been using FM synthesis for a LONG time because it gives such rich tonal character to a sound. Some of our favourite producers have built entire careers off using a FM synth like Ableton’s Operator. In Serum, not only can you use custom wavetables as your FM sources, you can also utilize the noise, and sub oscillators, as an FM source. This lends to a wealth of possibilities of FM synthesis in serum. 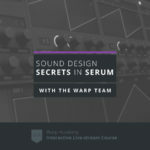 In this brand new tutorial on FM Synthesis in Serum, Darkside Funk sound designer, Dan Dusko, walks you through a complex pad created with Serum using powerful FM modulation.